Wax Worms - Environmental Innovation - They Eat Platstic! How many wax worms does it take to eat a plastic bag? No, this is not the start of a really bad joke, it is a possible environmental innovation. Enzymes produced by the wax worm (Galleria mellonella) have been found to attack the chemical bonds in plastic allowing them to eat through plastic at, what has been described as, “uniquely high speeds”. What are wax worms exactly? Essentially, they are the larval stage of the wax moth. They are referred to as nest parasites in bee colonies where they live on the wax. They do not directly attack the bees but do destroy their honeycomb home by eating the wax comb, causing contamination and assisting in spreading disease. Today, wax worms are harvested for fishing bait, as well as a food source for pet lizards and could possibly be the answer to the plastic bag pollution problem. Biologist and amateur beekeeper Federica Bertocchini made the discovery when she was cleaning out her beehive and moved some unwanted wax worm guests into a plastic bag. Later the worms were found to be wandering free, escaping through holes they had eaten in the bag. Whilst this could have simply been the actions of the wax worms’ jaws destroying the bag, further tests were done with recently deceased wax worms. They were crushed up and the mushed liquid remains were added onto a plastic bag where similar results were observed. So why could this be such a great discovery? Well, over a trillion plastic bags used globally each year. These bags often end up in oceans or in landfill site where researchers estimate it takes between 100 – 400 years for them to degrade naturally, polluting the globe in the meantime. Ellen McArthur Foundation researchers predict that “by the year 2050 there will be more plastic in the oceans by weight then there will be fish”. This could spell disaster for ocean ecosystems and food chains. Bertocchini of the Institute of Biomedicine and Biotechnology of Cantabria, Spain, teamed up with Paolo Bombelli and Christopher Howe of Cambridge to investigate the wax worm theory with further testing. 100 waxworms were added to a plastic bag and after 40 minutes, holes started appearing. The worms produced an average of 22 holes per hour. After 12 hours, 92mg of the plastic had been consumed, with estimates of a month being generated for them to break down an average plastic bag weighing 5.5g. 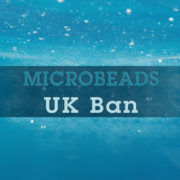 Previous trials, which focussed on types of bacteria, found that these microbes could only consume 0.13mg in 24 hours. 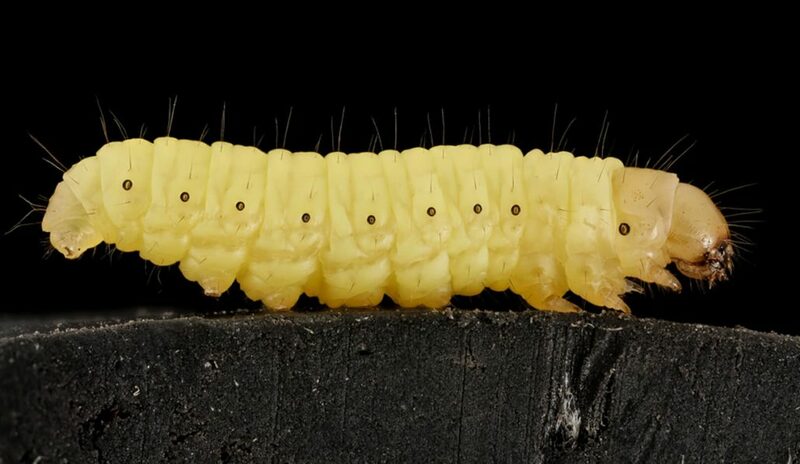 The results from these experiments showed that the wax worms ate through polyethylene (the most common plastic globally and notoriously hard to break down) more than 1400 times faster than other organisms. The research team used spectroscopic analysis to show that the worms did indeed break the bonds which held the polyethylene together, creating unbonded ethylene glycol (a chemical commonly used in antifreeze). Bettocchini hopes that future work will allow her to identify the specific enzyme(s) that breaks down the polyethylene. Dr. Bombelli has stated that the biodegradation initiative must work alongside measures to prevent their use in the first place. He is hoping that the enzyme, once identified, could be engineered in to an environmentally-friendly solution, reproduced on an industrial scale using biotechnological methods. He foresees adaptions being made to existing recycling plants to allow them to biodegrade mass amounts of plastics using the new enzyme. A future hope is that the enzyme could then be released directly onto landfill sites or infused into sea plants to remove plastics already polluting our environment. There have already been initiatives put in place to reduce the impact of plastic on the environment and these include the 5p charge on all plastic bags in the UK (which has already seen an 80% decrease in their use). The UK Government is trying to put through another prevention measure by charging 20p to bottles which can be refunded once the bottles have been recycled. 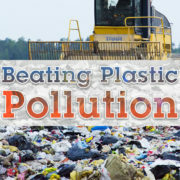 These initiatives would reduce further plastic into the environment whilst the wax worms would degrade that already causing pollution, an ideal scenario if it proves to be effective. Other experiments have been going on for a few years now. In 2011 researchers found fungus eroding polyurethane and another common plastic piling up in trash heaps and oceans globally. In 2014, a gut bacterium in another species of worm that could break down polyethylene was identified by Wei-Min Wu and his colleagues, although this produced different by-products. Research undertaken in 2016 identified a species of bacteria that produces enzymes that break down another form of plastic; polyethylene terephthalate. Whilst this may seem like an extraordinary breakthrough, further research is needed to determine the impacts should large scale production and release of the wax worm enzyme go ahead. Whilst it may degrade all environmentally polluting plastics it could have far reaching effects that have so far not been discovered.